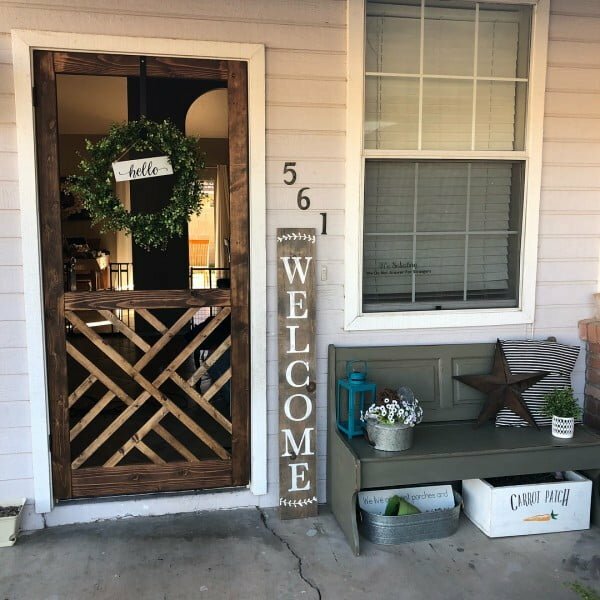 Looking to update your porch for a welcoming farmhouse looks? 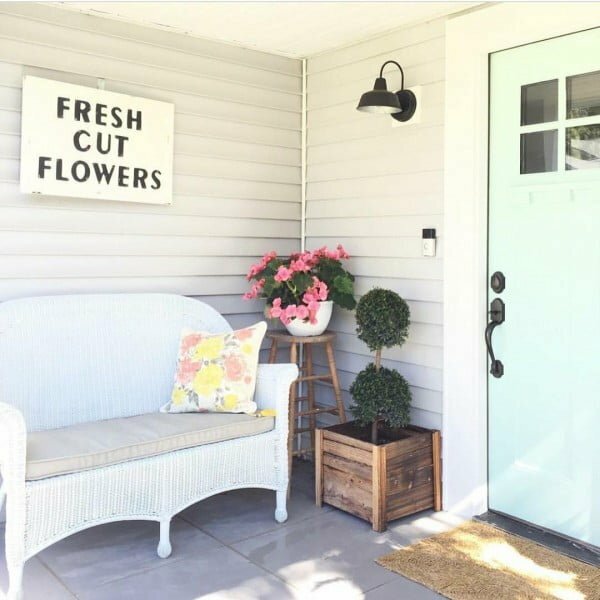 Here are 30 intriguing farmhouse porch decor ideas that will inspire you. 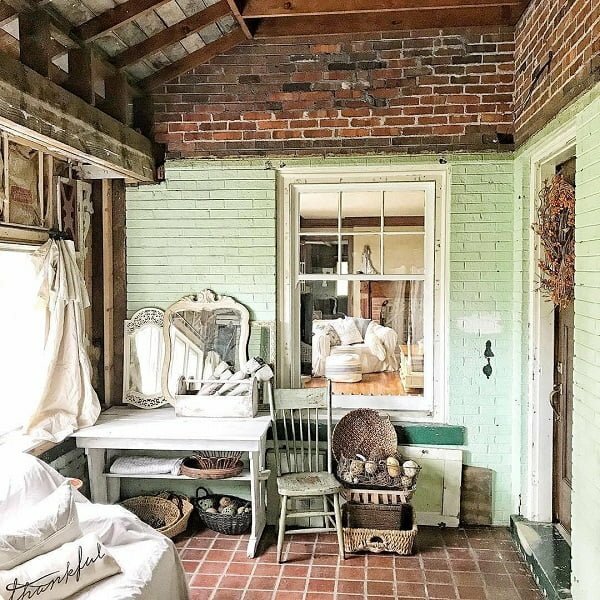 While farmhouse decor has always had a place in the world of home decor, the trend has recently experienced a rebirth. There are few things more sought after than farmhouse style furniture, fabrics, signs, and outdoor items. The quintessential admirers of this style strive to emulate in their homes would embody the warm, welcoming feel of a traditional rural farmhouse. Few things announce to visitors what lies within more than a well-decorated porch. 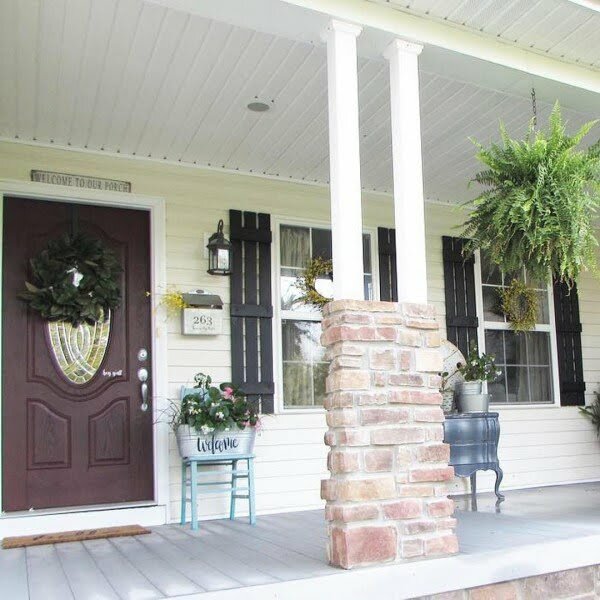 With some simple style ideas, you too can recreate the appeal of the farmhouse porch. 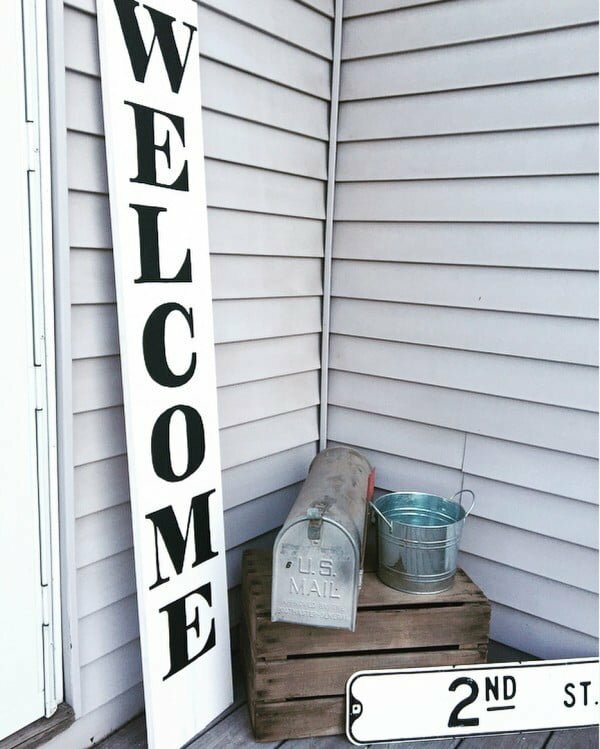 A warm farmhouse vibe is accomplished with a country-style sign to welcome guests to the home. 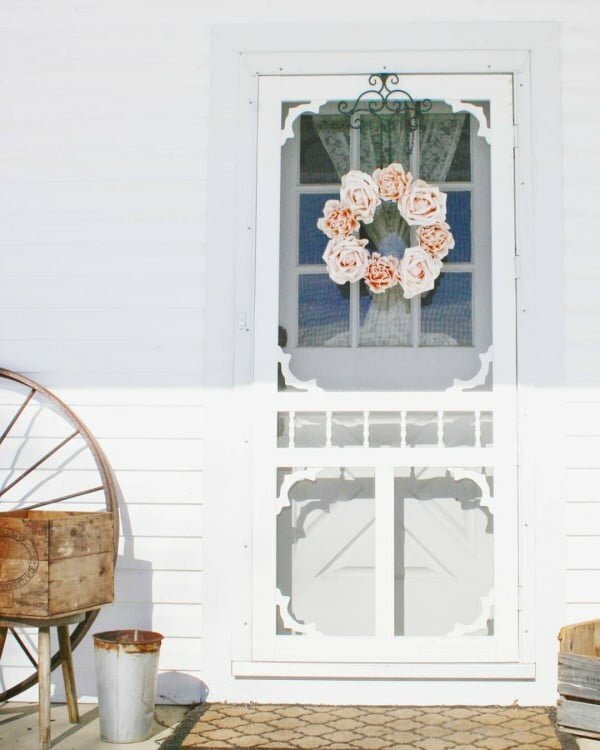 A wreath is a perfect addition to a home’s entrance decor. It can be easily switched out to reflect the current season and gives a warm, homey feel before even setting foot inside. 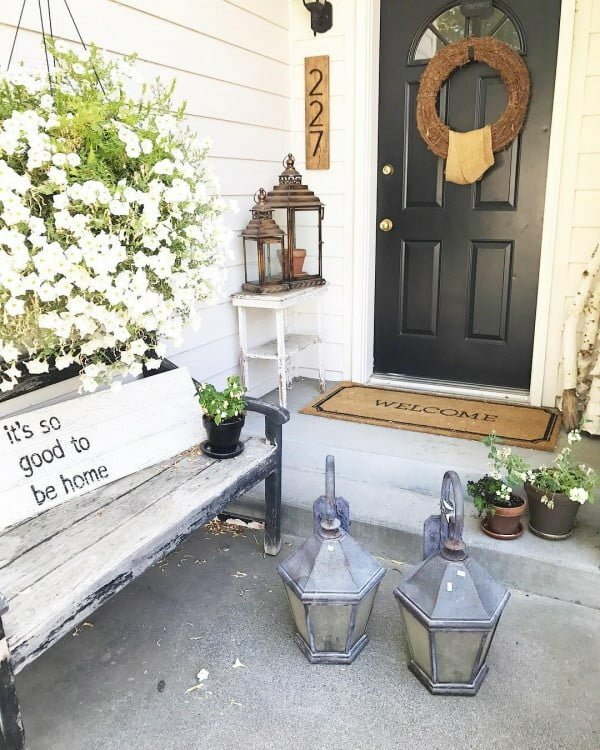 If you have space, adding a bench to your porch or front-door entry is not only a lovely focal point but is also very practical. The farmhouse look is easily accomplished with adding an item or two with farm animals depicted on them. 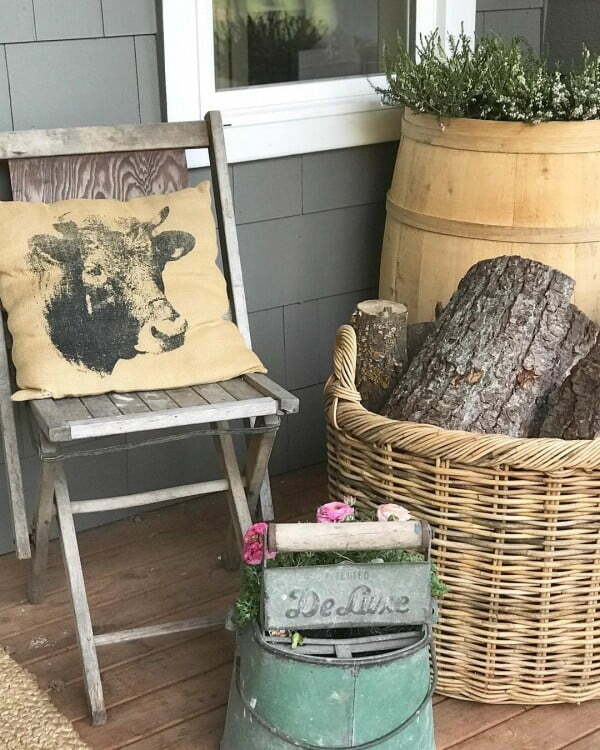 A decorative cow throw pillow adds just the right pop of country charm. 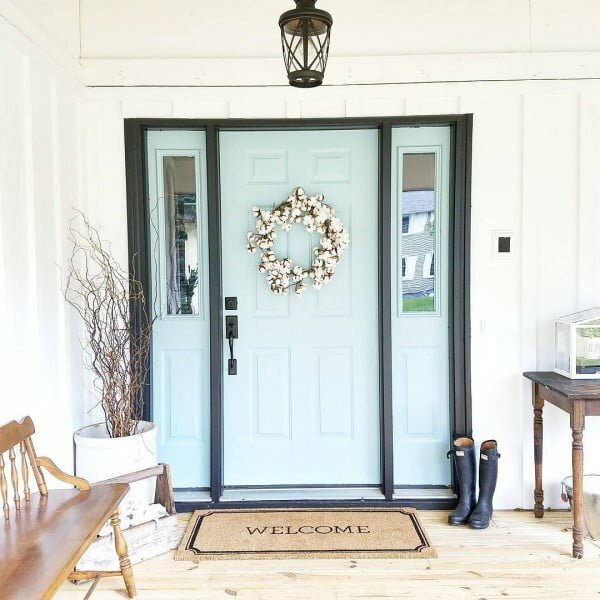 A country-style storm door with its curly wood cut out looks fantastic as a screen door, while fully embodying the farmhouse feel so many admire. 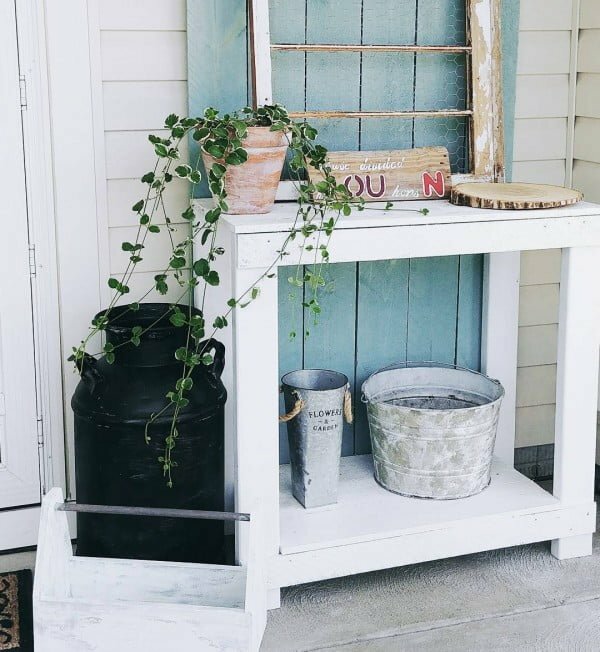 Adding a crate and galvanized container to your porch adds that ideal pop of farmhouse functionality. 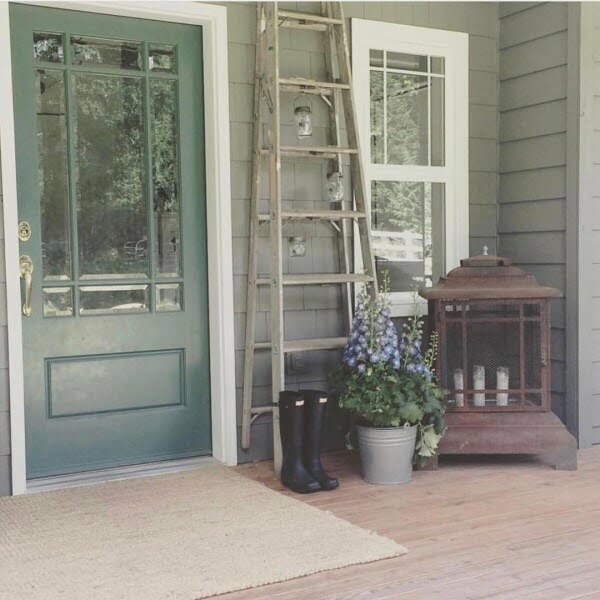 Adding some greenery to a porch is the best way to introduce the concept of bringing the outdoors in, one characteristic of farmhouse living. 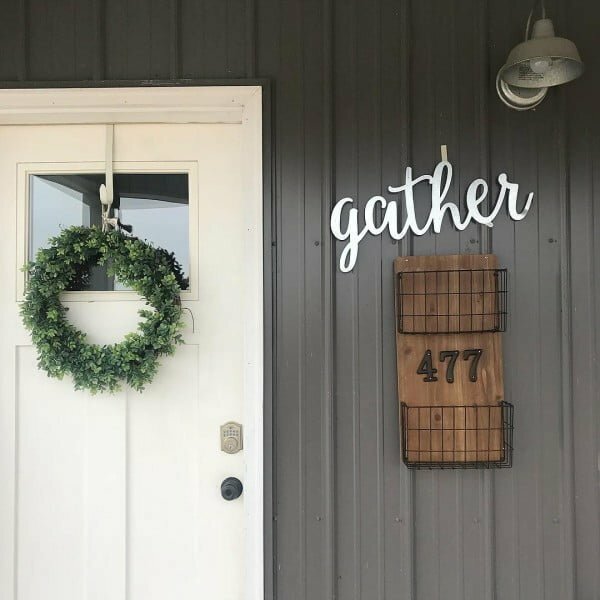 When it comes to farmhouse style, large signs top the charts. 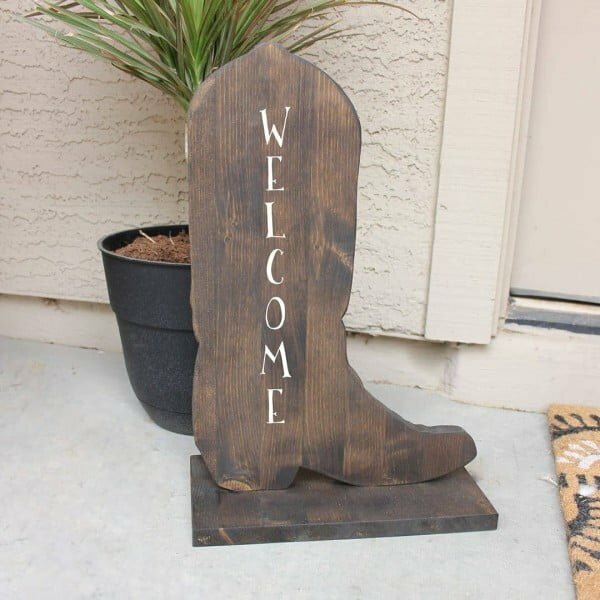 They add a graphic punch and deliver the ultimate country message of sending out a warm welcome to guests. 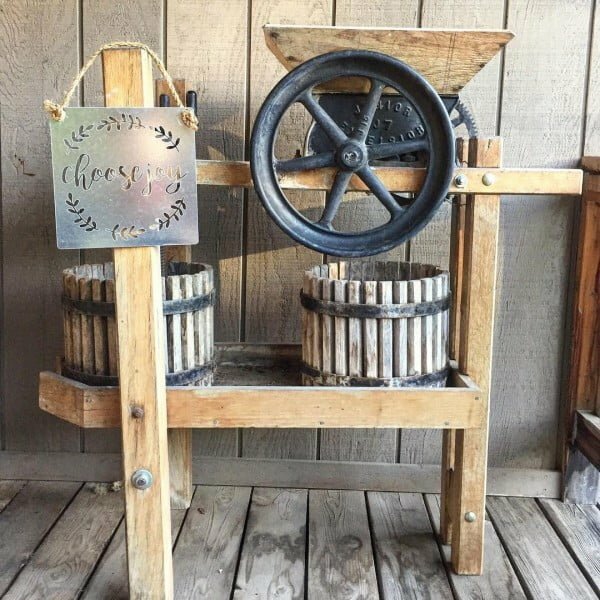 The repurposing vibe is alive and well in the farmhouse ideal as few things are thrown away; instead, items are given new uses by repurposing them. A unique number sign is a great way to get creative. Using vintage ladders are all the rage as shelving units, blanket holders, or to add some rustic style. One on a porch adorned with hanging lanterns adds a perfect touch of whimsy and character. Rustic-style furniture speaks volumes when it comes to the farmhouse country feel. A rustic wood chair and crate table work together to create the perfect entryway nook to enjoy that morning cup of tea. Having a basket with wood at the front door says that a warm hearth is awaiting within. Few things seem more farmhouse than the crackle and scent of a wood-burning fire. 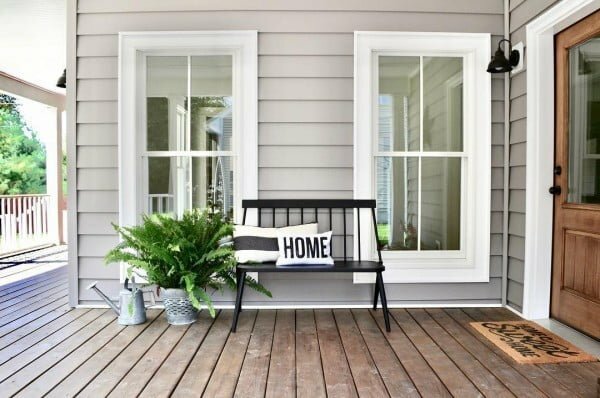 Adding a couple of functional furniture pieces to a porch is both practical and homey-feeling. 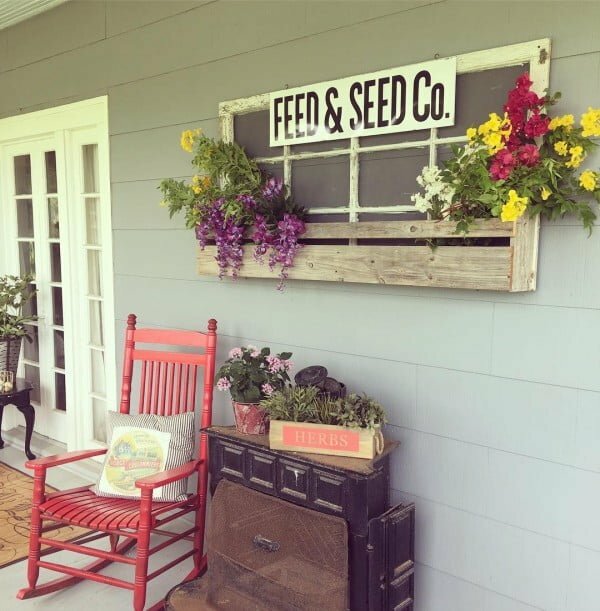 A rustic chair as a planter display is an ideal way to add the repurposed look to your farmhouse porch. 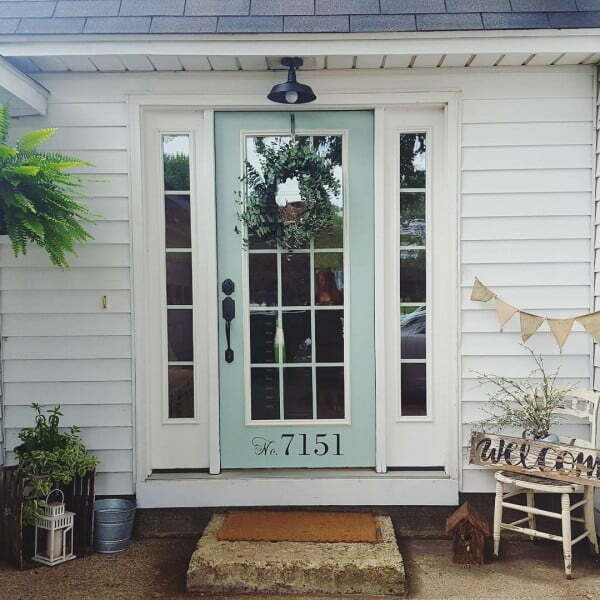 The very first thing people are told when they want to increase their curb appeal is to paint their front door. This can also be said when it comes to cultivating farmhouse appeal as it adds just the right pop of color. Traditional number plates at the front of a home are a thing of the past. Now, a stenciled number on the front door is both practical and unique, adding a perfect touch of whimsy and charm. If you want to make a large-scale space seem more intimate, breaking it up with some cozy throw pillows is just the right touch. Adding them to a porch invites people to linger just a little longer and enjoy the view. Old windows scream farmhouse. 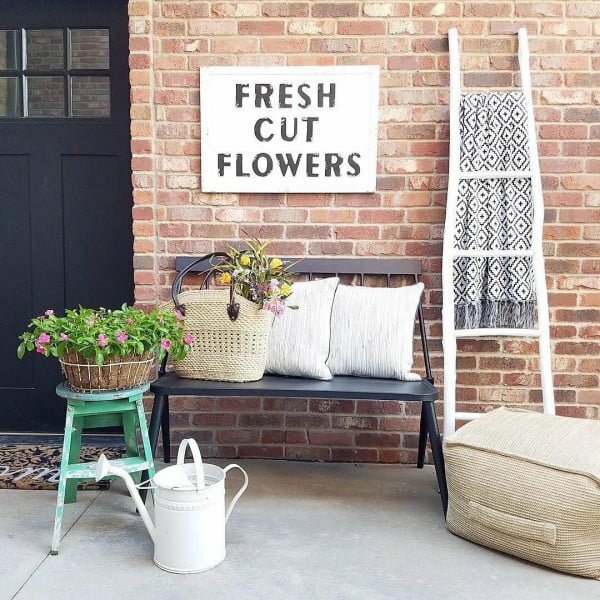 Turning a vintage window into a window box display for flowers is a lovely way to repurpose something that could very well have belonged to a farmhouse or old home at one time or another. 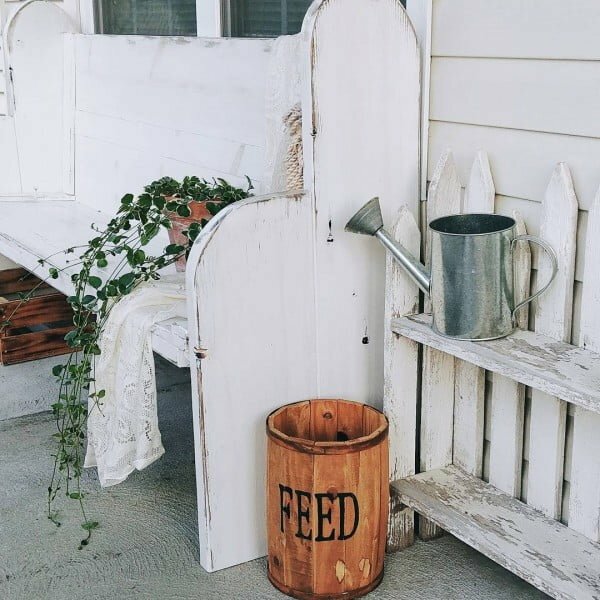 Add a feed bucket to your porch for the ultimate in farmhouse function. The bucket calls to mind a myriad of farm animals while adding a touch of storage as well. 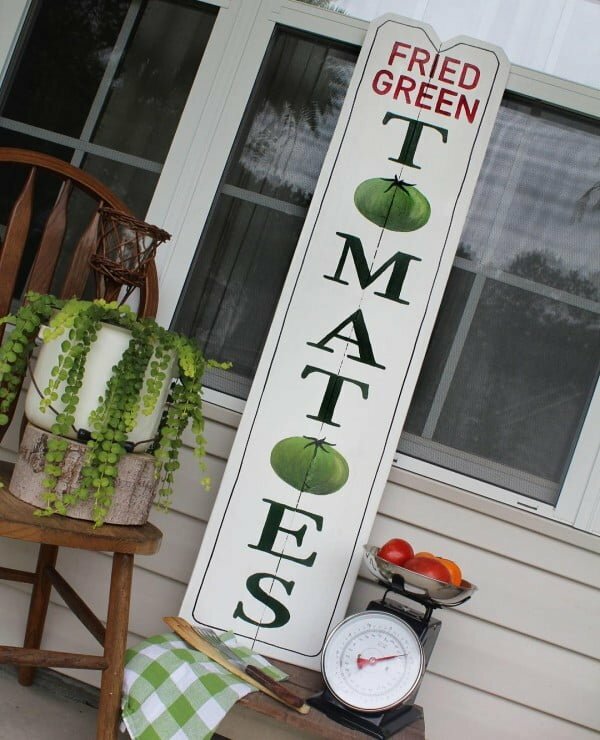 Adding a southern-style Fried Green Tomatoes sign calls that rural diner or farmers market stall to mind. It also provides the perfect graphic punch to warm the entryway. 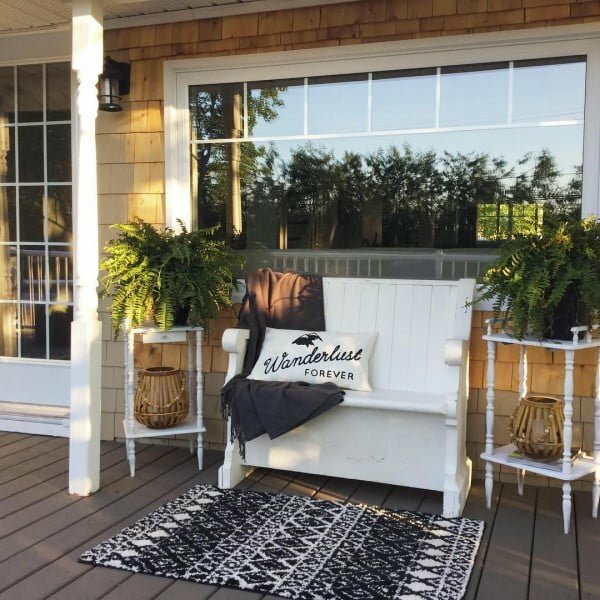 Creating an intimate seating area with a bench, some plants, and a rug encourages the farmhouse lifestyle of sitting out front, sipping lemonade, swapping tales, and watching the sunset. Warm the porch at night with the soft, reminiscent glow of a vintage lantern, guiding visitors to the home. 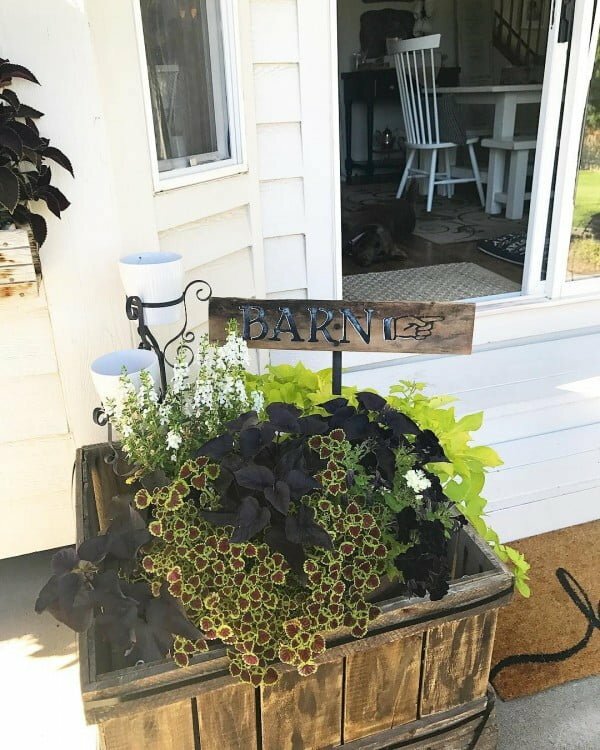 If you have come across a piece of farmhouse equipment in your travels, consider repurposing it for a porch decor item. It is a one-of-a-kind way to make a rural splash in a space. 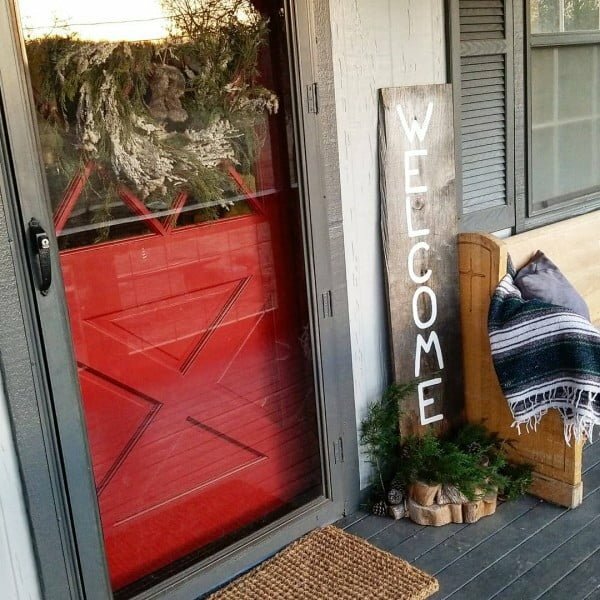 Even if you don’t have a barn, a sign suggesting there is one and in which direction to look can help guide the course of your decor style. 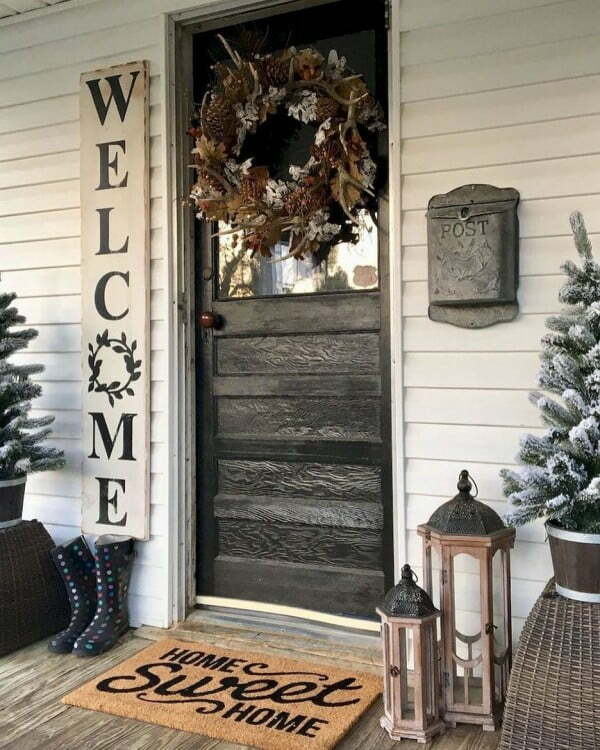 Adding a welcome mat to a porch is a practical place for people to wipe their feet, as well as delivering the positive message of country hospitality. 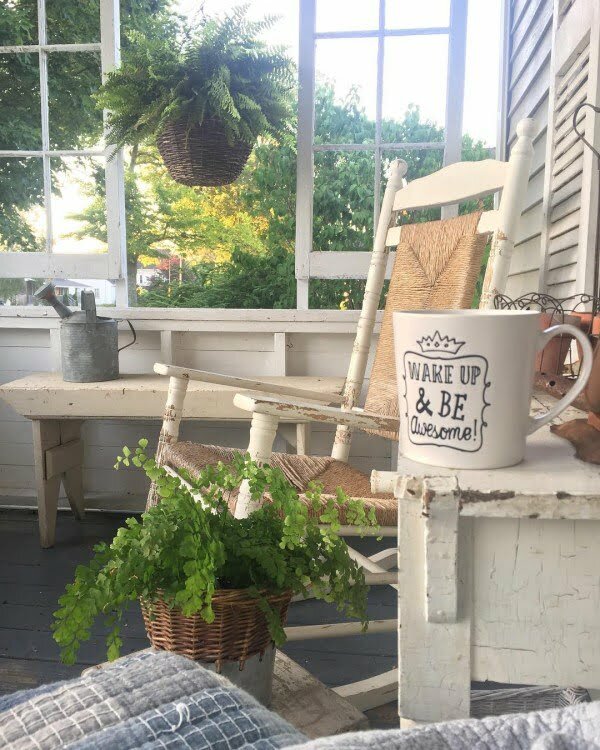 Creating a vignette, or story, on a porch is the perfect ode to the layering so characteristic of farmhouse style. Placing a few related items together like a table, some greenery, and containers are far more decoratively powerful than having a separate object here or there. 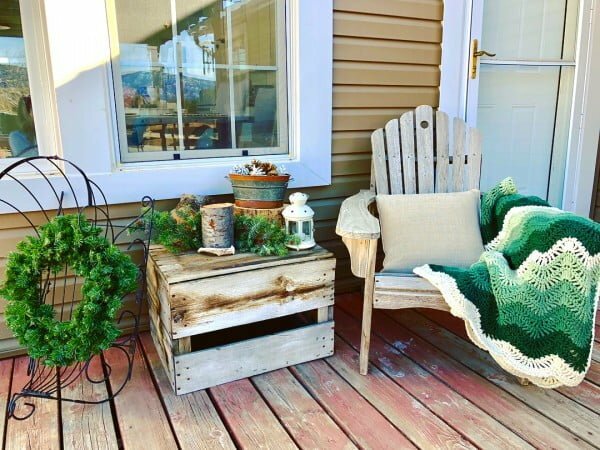 Painted wicker furniture has the rustic and country appeal for outdoor living that begs for people to slow down and settle into a slower pace of life. 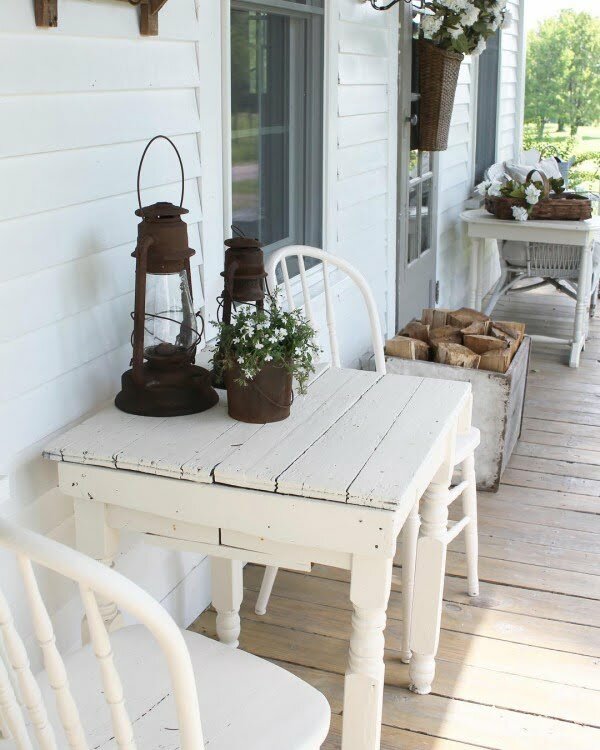 Having a small rustic wooden table painted white with an accompanying chair adds the perfect country cottage warmth and simplicity to a porch space. Chippy-painted furniture adds the vintage farmhouse appeal as it beckons to times past. 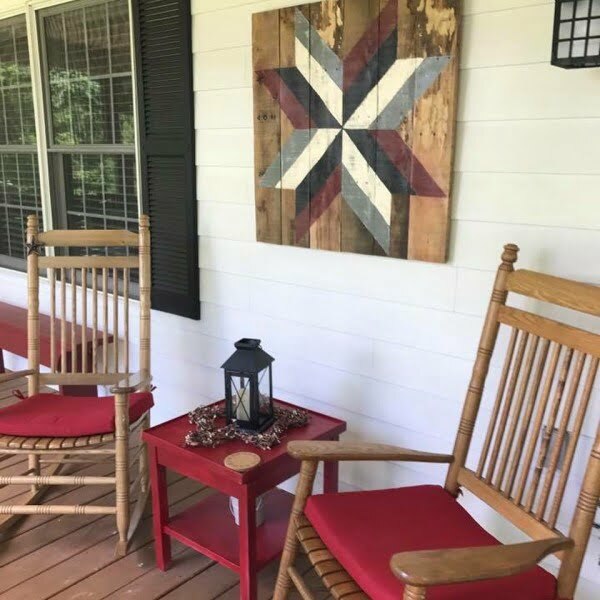 As quilts are the ultimate in country cozy charm, adding a quilt-style pattern to wood planks as an art piece adds the perfect artistic flair for any porch space. 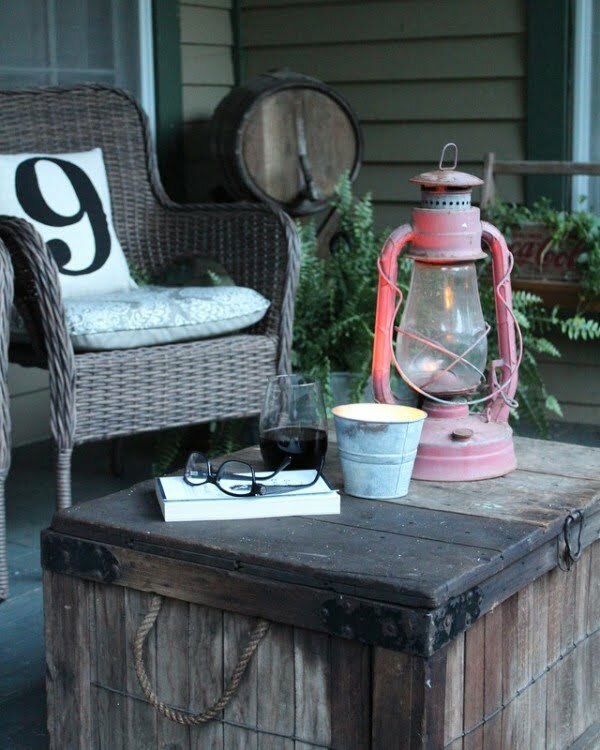 Few items create such a charming and cozy vibe as weathered and vintage rustic furniture. 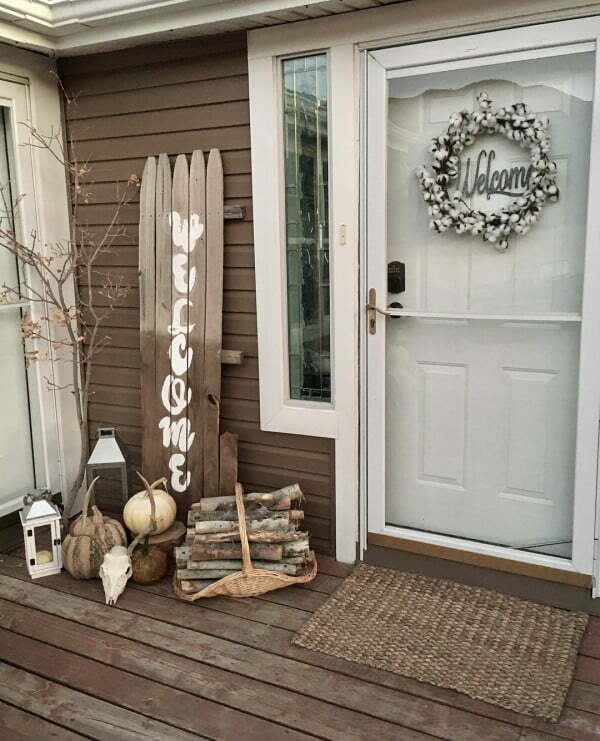 This porch has a very welcoming homey feel that we’d all love to replicate.